A quiet Saturday morning in Holmes Chapel, July 27th this year, was shattered by the screams of delight and excitement of hundreds of local children attending the opening of Play and Leisure’s latest transformation of an old and tired play area. Holmes Chapel is a semi rural village with residential properties, a local Primary School, several Public Houses and a church dating back to 1400. The play area had been provided at Middlewich Road for over 50 years by the Parish Council and maintained by Cheshire East Council. A Play area Project Board group was set up consisting of members of the Holmes Chapel Partnership, Holmes Chapel Parish Council and representatives from the local community to meet and consult with the local community to provide a new play provision on the existing site. Funding was secured from a community grant from Wren and with a contribution from the Parish Council. 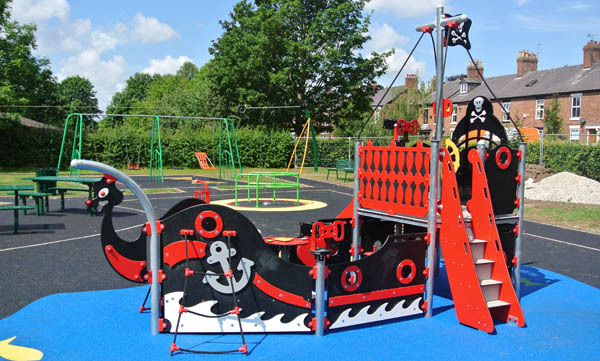 The design brief was to provide play equipment to suit the age range up to 14 years and the central area must contain a large multi/climbing unit for the younger children and a separate climbing unit for the older children, the theme for the younger children was pirates. Play and Leisure’s winning design contained at the Focal point a Pirate Ship, a Multi Play Activity Unit, Aerial Runway, Swings (including an inclusive Swing Seat), Spring Animals, Activity Net, Adventure trail, Talk tube, Free Standing Basket Ball Post, Inclusive Roundabout, Our ever popular Cantilever Basket Swing, Benches and Picnic Tables. Work Started in early July in the hot sun of a British summer under the watchful eye of the Play area Project Board and Cheshire East Council and was completed on time and budget by the 26th July ready for the grand opening on Saturday. Saturday morning was another beautiful summer’s day and the opening was attended by local Councillors along with the Worshipful Mayor of the Borough of Cheshire East – Mrs. Dorothy Flude, a lucky young lady who won the ballot to cut the tape, Board members and representatives from Play and Leisure. Invitations were displayed across the town to invite local residents to the opening and to enjoy ‘A Picnic in the Park. Children and parents alike agreed that the new play area was “Fantastic”, “a vast improvement”. Members from the Board were absolutely delighted with the finished play area and the way the contract had been handled and welcomed the opportunity to work with Play and Leisure again.